In 1395 Richard II invaded Ireland. As he marched through Ireland, he marched under his own insignia but also under that of Edward the Confessor (r. 1042-65). Richard was obsessed by the Confessor- the last Saxon king of England to hold his realm together for a substantial period of time, Edward had acquired the reputation in the Middle Ages of a saintly celibate King. The title of the English kings after him depended upon him: William of Normandy had claimed that Edward's personal nomination had given him the English crown and Norman chroniclers from William of Jumierges onwards substantiated that claim in their histories. 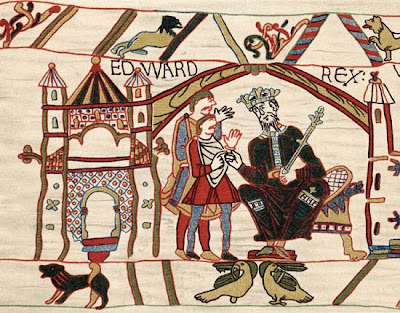 Edward thus was not merely seen as the last Saxon King, but more appropriately as the father of the Norman and hence Plantagenet Line which culminated with Richard himself. Edward's reputation in the Middle Ages though was not merely as the great saintly King, father of the nation, but also of the father of the nation's laws. As early as the reign of Henry I, the barons of England petitioned that the laws of King Edward be enforced- such intentions lay behind much of the agitation surrounding Magna Carta and as Corrine Westbrook and John Pocock have shown endured into the seventeenth century. The barons at Runnymede, the Diggers in Surrey made the same claim- that if only England could recall its original legal status under the Saxon monarch, all would be well. Of course neither of them knew the truth- for a start the whole idea of a national law depended on the legal reforms envisaged by William I at the oath of Salisbury and enacted by Henry II- neither did they agree- the baronial constitution and the Digger's millenary vision are about as far from each other as one could get: William Walwyn called Magna Carta a 'mess of potage', the average aristocrat of Walwyn's day thought the Leveller was a traitor, an anarchist and a heretic. The image of Edward's laws was incredibly powerful- and is something that I want to return to in more detail at a later date. But the image of Edward and the model of Kingship that he provided was equally powerful and is perhaps less appreciated. Lets return to Richard II. Why did he raise that banner at that moment? Richard did not particularly care for law- he had an uneasy relationship with his Parliaments and disdained the advice of his magnates- many of whom, the appellant lords, Arundel, Warwick and Gloucester, became heroes of those that would restrict the rights of the crown. Rather Richard saw himself as the successor to Edward in his saintliness. For Richard- the two Edwards- the Confessor and the Martyr (an English king Edward had been assacinated in the 8th century by the Vikings and was canonized shortly afterwards) represented a vision of Kingship very much in accordance with his own. Richard saw himself as various documents attest as a direct representative of God on earth. The end of the 14th Century saw an upswing in millenarian agitation- there were rumours of an Anglo-French alliance to reunify the battered Christian body (split at this point between two Popes one in Avignon and one in Rome) and turn it against the Turks who were rampaging through Southern Europe. Major members of Richard's court believed in this: John of Gaunt, the Duke of Lancaster, toyed throughout his life with going on a crusade- one of his sons, Sir John Beaufort actually did and was defeated in 1395 at the battle of Nicopolis, another Henry IV (king after Richard) dreamt as much as Richard of taking on the Turk and reclaiming Jerusalem. Famously Henry was told that he would die in Jerusalem- but fell into eternal night in the chamber of the House of Commons and not in that of the holy sepulchre. Richard shared that sense of the religious nature of kingship. Look at the engravings and art made about him in his reign, if you look for instance at the Wilton Diptych- a piece of art that has bemused and confused historians for generations (and I cannot clarify that confusion at all)- but the clear emphasis is on catholicism and its relationship to the young king. Pamphleteers and chroniclers from Froissart in France to the most jaundyced of his opponents also bear testament to the King's determination to make himself into a saintly ruler. The image of King Edward returned. Richard wanted also to canonize others of his ancestors- he pressed the Pope that his great grandfather Edward II should be canonized and he paid attention to prophesies which told him for instance that an English king would conquer Ireland and then retake the Holy Land. Richard's elevation of the Confessor into a saint- and a saint who would support his particular model of sacral Kingship should be seen in the context of the instability of the English crown. Of Richard's predecessors, only Richard I (r. 1189-99), Henry III (r. 1216-72) and Edward II (r. 1307-27) succeeded to the crown without having to battle or dispose of other claimants. Richard would remember that the reigns of Henry II, John, Henry III and Edward II had all seen civil war take place in England. For Frenchmen living at the time England was a nation of traitors- a nation where monarchy was unsuccessful. Furthermore Richard had to face his powerful uncles- Lancaster, Gloucester, York- who dominated the politics of his reign and many of whom had greater credentials for the role than Richard himself. Turning his eyes back to English history, meant recreating a monarchy for him that made sense- as a connection between God and the people, between the sacred and the secular. For Richard then it was natural to turn to the saint King Edward- who had afteral combined both devotion and rule in the same person. Furthermore Edward ressembled Richard in other ways- in his childlessness for example. By 1395, the widowed Richard had decided to marry a five year old Princess of France- children were not on the agenda! It is pretty easy to see why Richard looked to Edward but it also reminds us of the way that 1066 was and was not a division within English history. The crown owed much of its powers to the way that William of Normandy, William I, had interpreted the act of conquest- he had essentially by the Oath of Salisbury bound all tenants in England to owe fealty to the crown and not their tenant in chief (as Dr. Garnett's research makes clear). But he had done something else- he had based his title on the nomination of his predecessor as king of England, Edward the Confessor. Doomsday Book contained two dates- the date on which King Edward was alive and dead and the date of the survey- and that fixed the Norman claim to be that England had passed, by nomination from the Confessor to the Conqueror. That point meant that the Normans were bound to Anglo Saxon England- and that as the royal title depended upon the events of 1066 so did arguments in favour and against the crown. In the seventeenth century, Sir Edward Coke argued that there had been no conquest, as did Sir Matthew Hale- Gerald Winstanley effectively suggested that William was not the heir of Edward. In the reign of Richard II, we see Richard go back to the beggining of his dynasty and fix his eye upon the sainted King and suggest that he was attempting to recreate that era. Norman fixation with Edward as the legitimator of their dynasty had turned into a Plantagenet quest for models of royalty to fortify the crown in an age of uncertainty. The reasons that Richard looked back to Edward arise out of the pattern of English history- and the crucial place of 1066 within that history- and out of the particular circumstances of his time. By going back to Edward he sought to create a model of sacred Kingship that he hoped could strengthen the crown and provide the springboard to English armies doing God's work in the Holy Land. This is a fascinating Radio Program- just what the BBC do best- about the moment in September 1983 when the world almost ended through nuclear war. Its worth listening- just to realise quite how scary the cold war was- and how little both sides understood the other and furthermore how that misunderstanding might well have propelled the world into utter catastrophe. A Man for all seasons was made in the 1960s about events which took place in the 1530s. It is of course highly inaccurate. It concerns the life of Sir Thomas More, a formidable lawyer and politician who briefly rose to become Chancellor of England in the 1530s before being executed by Henry VIII for high treason later in that decade. More was one of the leading opponents of Henry’s marriage to Anne Boleyn and his creation of the Church of England and eventually was executed for his opposition. The film takes a positive view of More and traduces other characters of the period- Thomas Cromwell for example and Richard Rich- More afterall burnt those who disagreed with him at the stake, Cromwell and Rich were not as self serving as they seem here, nor was Archbishop Cranmer, but historical inaccuracy is seldom important within a movie. The spell of 90 minutes cannot capture the intensity or the incompleteness of historical time- no more than it can recreate the intimate texture of a novel. As with the adaptation of a book, the adaptation of history is the use of history by the director to fit his or her template. The intelligence of the film maker creates his or her own history of a period: and the real questions that can be asked are not about accuracy (inaccuracy is guaranteed) but about the degree to which the director is historically aware and the degree to which the film makes an interesting point. Both of these concerns I think are reflected in a Man for all Seasons however imperfectly and make it, though bad history, a good historical film. Thomas More’s life took place against a wide European debate about what a wise man ought to do at court. Should the wise man abstain and cultivate his wisdom in academic leisure? Or should he attempt to councel princes to abandon their fleshy desires and turn their minds to the improvement of the public good? Would such councel be listened to if proffered and would association with a prince end up with the wise man, the philosopher, being corrupted by such association? These ideas of course were not new in the 16th Century: Aristotle had argued that politics is the appropriate area for men to exert themselves though he too had given credit to the life of leisured contemplation in his Politics. Thomas More himself was aware of the subject: in his own Utopia the subject is a matter of dispute between a character called More and the sailor Raphael Hythloday who argues that there is no such thing as a prince willing to listen to a wise man. This dilemma is referred to openly at the beginning of a Man for all Seasons when More is asked by a young potential protégée, Richard Rich, what he Rich should do. More tells him that the court will offer him only corruption and that Rich should go into teaching and content himself with a private life, where only his friends, his students and his God will know him. That dialogue runs straight through the Man for all Seasons. This is a film about a central issue in the sixteenth century, what to do when you are in a court? Various characters in the film operate by various strategies. Thomas Cromwell is a psychopathic killer, enjoying the freedom granted by having the King’s ear to mow down anyone in his path. Richard Rich is in the film a man afflicted by his ambitious desires, if the only way to do that is to perjure himself, then he will sweat with pangs of conscience but he will swear. The Duke of Norfolk is a third case: Norfolk goes along with Cromwell because he has things in life and fears that they will be taken away from him should he not. Norfolk like Rich is a courtier from a human emotion, only in his case it seems not to be ambition. Norfolk is at court because he is a coward. We know he really agrees with More, furthermore we know that he does not like the proceedings against More and even at More’s show trial right at the end of the film, Norfolk sympathises. But crucially sympathise is all he does: because do more than sympathise and his life is forfeit. And then of course, fourthly there is Sir Thomas himself. He eventually abandons his own life for the sake of something higher: as he says to the witnesses of his execution, ‘I die his Majesty’s good servant, but God’s first’. The film is most interested in unpacking More’s motivation for his lonely steadfast stance. We are told that he could have escaped from the axe. 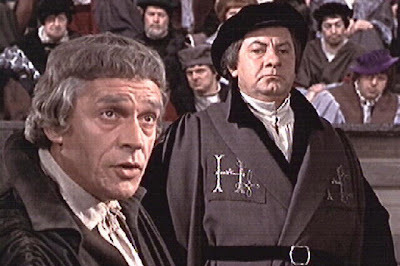 We are shown that he could have escaped and that many wished, as far as I can see every character bar Cromwell in the film, wishes that he would escape. So why did he do it? The first answer is that he did it out of his religious faith: and the film argues that he did say that that was why he did it. Schofield, playing More, pronounces speech after speech stating that it was faithfulness towards God that kept him constant. And yet again, we are reduced to asking the question what made More special. What was it that kept him firm to his promise when everyone else fell back? In all eras, at all times, there are men and women who seem to keep faith with an idea despite the rack and the torture chamber, despite the axe and the noose. Rather than being interested in the specific idea or sixteenth century context, the film makers are interested in the universal quality of steadfastness for an idea. Why does More stay faithful to this idea? He tells us that an oath is ‘words we say to God’, that ‘when a man takes an oath, he is holding his own self in his own hands like water and if he opens his fingers then he needn’t hope to find himself again’. He does suggest that man’s natural business lies in escaping, but his argument is that this is an oath that he cannot take. He cannot stand up and say without betraying the essence of himself and his relationship with his creator that Henry VIII is supreme Head of the Church of England and Anne Boleyn his rightful wife. It is in part a theological question and Roger Bolt the writer leaves us in no doubt that More’s argument is theological: God has put him into this situation to test him and he will pass the test. If history forces him to be a hero and a saint, then that is what he would rather be than stand at the gates of heaven and say that he broke his vows of love to Christ. But Bolt’s twentieth century sensibility adds to this an existential angle- identity is what More talks about all the time. It is not merely hell he worries about but what he is, the fibre of his body he says to Norfolk is bound up in this moment. And should he forget that fibre, should he decide to recant, then he would lose what made him himself. Henry VIII here represents not just a threat to an immortal soul’s chance of heavenly glory, but to the soul’s chance of being itself. Tyranny threatens not merely the temporal or heavenly existence of the individual but the individual as an entity. More preserves his self, not by speaking, but by utter and absolute silence. His refusal to speak is a refusal to define himself by categories that the outside world employs- at one point he even tells his judges that the outside world must judge him as it wishes, but his silence proves that any of their surmises could be correct. More’s silence is a refusal to be defined- but its also a withdrawal from the world of the court where words of course are used to charm, flatter and deceive about one’s own purposes. More refuses to do that, words for him are tools to reveal himself and as they are used for courtly ends, they fail a man’s inner personality. What matters to More is not that ‘I believe it’ but that ‘I believe it’, such integrity in the world of a court leads to his resignation and eventually his execution. The perfect courtier, Thomas Cromwell, knows that he cannot be believed for his word is worthless, a product of expediency in the battles of the court for power and ultimately possession. Silence is of course an apt way to proceed- the court demands answers, the court demands flattery, laughter in the appropriate places. To be silent is to reserve one’s personality, is to declare one’s individuality and to declare the solitude of one’s own personality. That is why the film shows More’s silence to aggravate the servants of tyranny. When More asks for liberty as ‘I do none harm, I say none harm, I think none harm and if this be not enough to keep a man alive, then in good faith I long not to live’ he defines a liberal creed, as opposed to tyranny which demands men speak and perform acts in pursuit of a policy. All More asserts is the liberty to retire, Cromwell and the court argue that no man can retire and that all of life is political and ultimately punishable. It is a modern theme, but explored using a historical story and furthermore running out of historical themes. The conflict between courtliness and honesty, between Kings of heaven and Kings of earth was a real one in the sixteenth century. The film may not be historically accurate but it captures the pressure of being at court, and the dangers of iconoclasm very well. As a meditation though, it is imbued with modern ideas and modern analysis. It is about the way that More’s resistance to tyranny is an existential resistance, a resistance based around the individual’s integrity to himself. The assertion in the film goes further than anyone in the sixteenth century would have gone, the film asserts that only under a liberal regime is it possible to retain one’s individuality. Only under the law is it possible to retain one’s extra legal personality. Curiously, the argument here is that only under a liberal regime is it possible for an honest man to serve in politics because he has the liberty to abstain from supporting his state, even at the moment of highest drama. Silence is a privilege maintained by liberal governments. Ultimately under liberalism, the vultures- Cromwell, Wolsey, Rich, Norfolk will all survive- but More will not lose his life, merely his career. For More, there can be no disconnect between the private personality and the public one- one cannot sublimate the former to the latter unless with silence, and that is of course something that no tyrant will ever allow. It is though a problem that even the opportunist feels: on his death bed we see Wolsey tell Norfolk, ‘If I had served God one half so well as I had served my King, God would not have left me here to die in this place’- Wolsey doesn’t mean the place that he dies, he means the place of dishonour that he dies within. The contrast to More’s death which he meets with serenity and the assurance that he is to go to a better place is the contrast between two victims of tyranny- the one victim who bent to the will of his King, the other who did not. The victim who bent dies though with the knowledge that he became an instrument and was discarded when the life was sucked from him. That is the fate of the courtier under tyranny: a fate that the film’s Thomas More avoids with his silence and his execution.